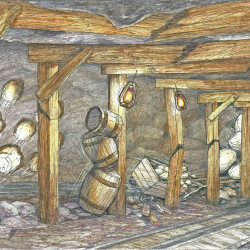 Knott’s Calico Mine Ride Re-imagined! 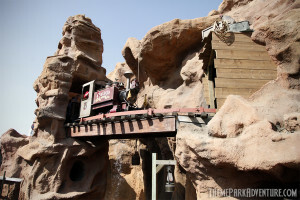 One of the most influential and iconic dark rides in the history of themed entertainment is the Calico Mine Ride at Knott’s Berry Farm in Buena Park, California. 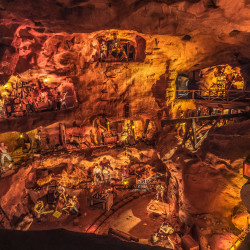 Opened in 1960, the Mine Ride has taken countless visitors on a fascinating, historically educational trip through the winding passages of a 7-story-tall mountain smack in the middle of the Farm, and has ignited the imagination of future theme park designers ever since. 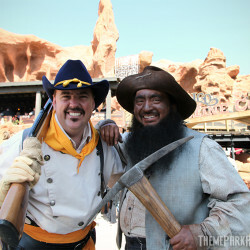 In 2013, Knott’s Berry Farm and Garner Holt Productions entered into a partnership to fully restore the Calico Mine Ride to its former glory and then some, with updated animatronic characters, creatures, and scenes. 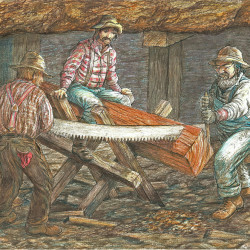 The renovation would follow in the footsteps of the astonishing Timber Mountain Log Ride refurbishment that the two companies had just completed. 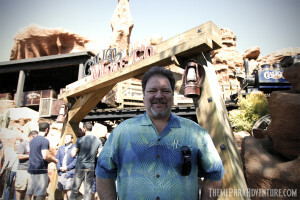 In January of 2014, Calico Mine Ride shut down, and Knott’s designers along with Garner’s team of creatives rolled up their sleeves and went to work inside the famous mountain! 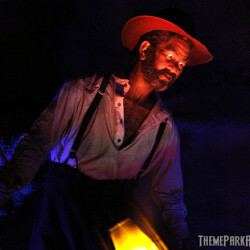 Many of us have grown up with the Calico Mine Ride. We’ve taken umpteen journeys into the shafts and underground chambers of the attraction, marveling at the bubbling mud pots, peering into the dark water of its underground lake, straining to see just how deep the “bottomless pits” truly are in the majestic Cavern Room, and gazing in wonder at the ride’s massive Glory Hole, bustling with an entire team of miners drilling precious metal from the core of the mountain. That close bond that we’ve shared with this attraction has helped diminish the fact that more than five decades of wear and tear had really taken a toll on the beloved mountain. Truth be told, by the time Knott’s closed the Mine Ride this year in advance of its massive renovation, the attraction was in really bad shape. 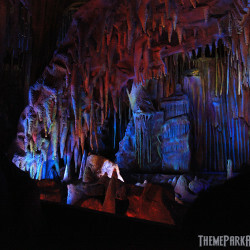 Practically none of the animation worked any longer, the show lighting throughout the mountain was in dire need of updating, and the blasting tunnel was no more than a sad fizzle of a finale. In the late 1950s, Walter Knott was looking to add a major new attraction to his already-popular Ghost Town. 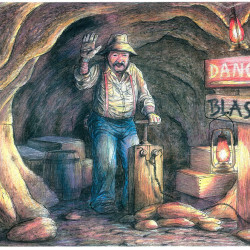 Bud Hurlbut approached him with the idea for a historically educational, completely immersive dark ride that would allow Knott’s guests to see the inner workings of an old mine; trains loaded with curious guests would take people on a 7-minute excursion through chambers filled with steam geysers, underground waterfalls and a huge centerpiece filled with equipment and miners hard at work. The concept sounded like a winner, and gave the go-ahead to Hurlbut. 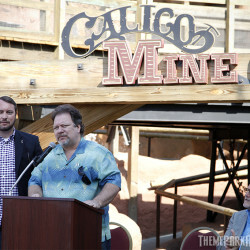 Funding the Calico Mine Ride did not come from the Knott family. Since Hurlbut was one of the Farm’s concessionaires, he actually paid rent to Walter Knott to have attractions at the Buena Park property. In fact, to pay for the building of the Mine Ride, Bud sold off his own ranch, a new Cadillac, and his home here in Southern California. The mountain, which took 150 tons of steel, and 125 of reinforced steel to build, proved to be very expensive – and Bud’s finances were in peril; there was no turning back. 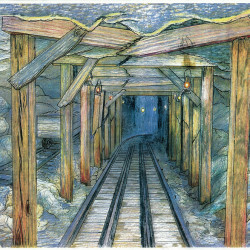 Hurlbut would literally have to strike gold with the Mine Ride to recoup his personal investment. 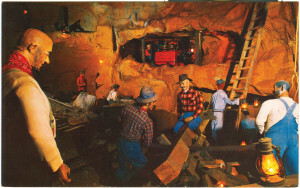 The nearly $1 million it took to build Calico Mine Ride in 1960 would cost about $8 million today. As cash dwindled, Bud appealed to Walter Knott, who allowed him to forego rent payments to the Farm because he believed in the project and wanted to see it succeed. In November of 1960, Bud Hurlbut opened the Calico Mine Ride at Knott’s, and visitors were instantly captivated! Word of mouth spread quickly, and the new attraction was bursting at the seams with excited guests. Only 8 months later, Bud sold his one millionth ticket to the Mine Ride, and by 1962, he was in the black financially – he’d made all of his nearly $1 million investment in the mountain back, and then some. There really was gold in that ol’ mine for Bud and Walter! 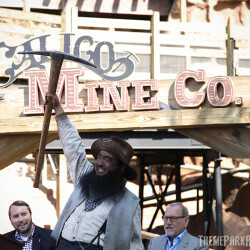 The significance of the Calico Mine Ride was great. Keep in mind, this attraction featuring animated miners in many scenes pre-dated all of Disney’s animatronics-based shows by years, with the Enchanted Tiki Room opening at Disneyland in 1963, and Great Moments with Mr. Lincoln, It’s a Small World, and The Carousel of Progress debuting at the 1964 New York World’s Fair. Pirates of the Caribbean would open at Disneyland in 1967, followed by The Haunted Mansion in 1969. 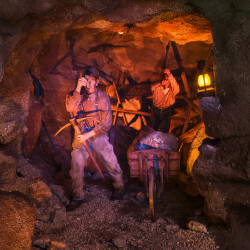 While the figures used in the Calico Mine Ride were not robotic in nature, they did take the Berry Farm and industry one giant step forward toward Audio-Animatronics as we know it today. Walter Knott and Walt Disney were very cordial with one another. Disney fans may even be surprised to learn that frequently, Disney and his team visited Knott’s Berry Farm to measure walkways, discuss experiences with patrons, and to share ideas with their Buena Park neighbors. There was never any rivalry between the two men; while the theme parks today are both competitive with one another, it is a friendly competition – it always has been, and hopefully, always will be. 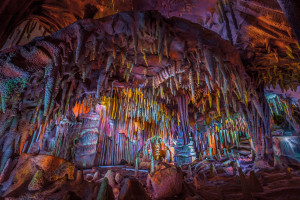 One of the most famous scenes in the Mine Ride is the Cavern Room, also known as the Heaven Room: a huge chamber filled with thousands of rainbow-colored stalagmites and stalactites, and sparkling waterfalls. Illuminated by black light, this portion of the Mine Ride was dubbed “Heaven Room” because it comes after a 160-foot-long, 25-degree climb from the bottom of the show building to its top. 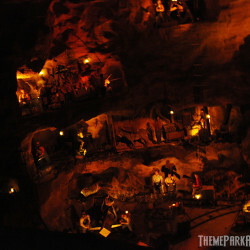 Hurlbut said it was just like coming up into Heaven, and wanted it to be breathtakingly beautiful for guests – especially the women passengers; he was worried that all of the “manly man” content of the ride would prove dull to female guests, and so the Cavern Room was created to balance the theme out a bit. 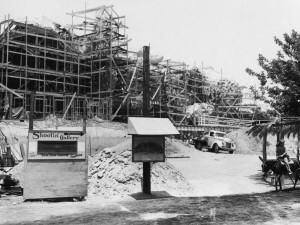 Hurlbut and Walt Disney discussed this concept, further shedding light on the friendly relationship that Knott’s and Disney shared in those days. When the attraction opened in 1960, Walt Disney came to the Farm to check it out. 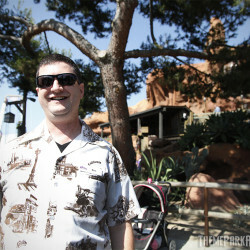 Not only was he impressed by the ride experience, he was taken by surprise by the ride’s hidden queue. 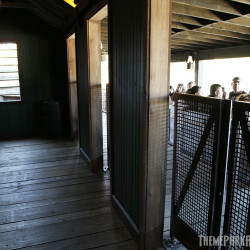 On the outside, there weren’t any guests in the switchback area in front of the attraction. 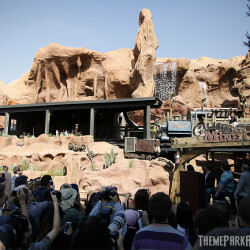 However, as Walt got in line, he quickly realized that there were a couple hundred visitors in line ahead of him – a winding pathway through rock work, under the train tracks, and past thundering waterfalls. Disney is quoted as saying, “My God, that’s a sneaky thing! 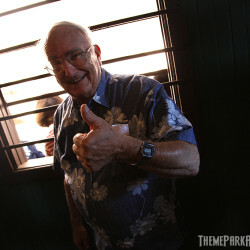 Here’s there’s two hundred people in line back here, and I didn’t know there was anybody!” Bud had inadvertently created the hidden queue – something that many attraction designers use to this day as a rule of thumb. 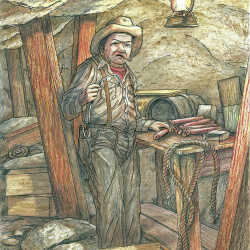 Walt Disney wasn’t the only famous Imagineer that the Calico Mine Ride made an impression on. 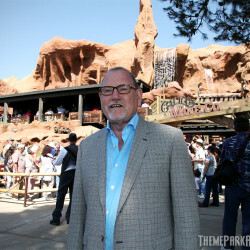 Tony Baxter (one of the most beloved and influential Imagineers of the past several decades) grew up visiting Knott’s and was enamored by the Mine Ride. 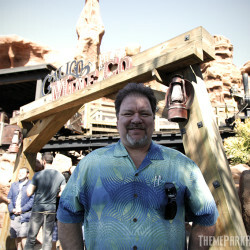 In fact, he states openly that he drew an incredible amount of childhood inspiration from the Calico Mine Ride when designing Big Thunder Mountain Railroad for Disney. 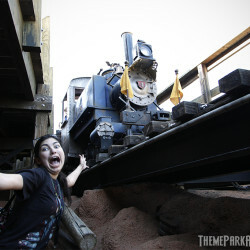 The similarities are there – especially the hidden queue, which takes Disney guests along winding rocky pathways littered with mining GAK, and even under train tracks as they wait. 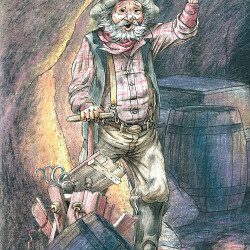 It’s awesome that Big Thunder and the Calico Mine Ride share these commonalities, and it says a lot that Bud’s Mine Ride served as a source of major inspiration for one of Disney’s most popular attractions ever! 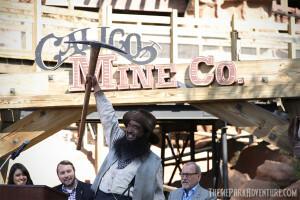 The Calico Mine Ride hasn’t just been a hit with designers and casual park visitors over the years; it’s got a very loyal following of Halloween Haunt fans as well. Since Bud and his team started spooking up the Mine Ride in the early ’70s for Knott’s Scary Farm, the mountain has been home to many frightful overlays, from aliens and lost civilizations, to dragons, restless gunslinger spirits, and most recently, a witch. 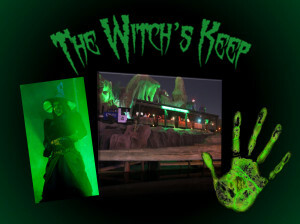 The latter is a theme developed by Haunt designer Gus Krueger for the mountain’s most recent overlay, The Witch’s Keep. The logistics of placing live talent and large-scale props throughout the mountain have become more daunting each season, as the attraction ages and becomes more delicate. Knott’s management has stated that following the major Log Ride renovation, that fans shouldn’t expect much in the way of Halloween Haunt overlays any time soon. And that’s understandable; the company spent millions on new scenery and animatronic figures; live talent running around, possibly damaging the new scenes and figures is simply not a chance the park is going to take, and we support them 100% in that decision. The question now on the minds of Halloween Haunt fans is, what will become of the Mine Ride as a Scary Farm attraction now that it too has undergone a multi-million dollar renovation? 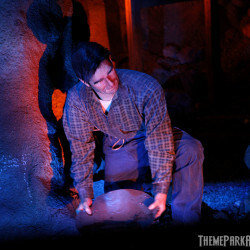 All of the Mine Ride’s show lighting has been replaced by state-of-the-art LED components. One of the great things about LED arrays is that you can completely change the lighting of a scene (including color) very easily. Knott’s kept this in mind when installing all of the new LED fixtures inside and out of the mountain, and it appears that Haunt fans will indeed, continue to be treated to spooky thematic overlays to the Mine Ride much in the style of The Witch’s Keep, for years to come! We imagine the park may also put some nifty special effects in the Haunt version of the ride as well, along with perhaps special recorded soundtracks to enhance the experience. The days of live monsters in the mountains may be gone at Knott’s (something Theme Park Adventure has supported and called on for years due to the damage that takes place within the attractions because of Haunt), but it appears that all of the new tech and lighting design used for the Mine Ride renovation will actually help keep it spooked-up for years to come! Which brings us full-circle to the present. 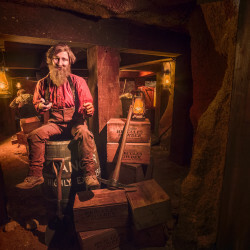 Knott’s designers, under the direction of Lara Hanneman, worked in concert with the folks at Garner Holt Productions to completely renovate the Mine Ride in just half a year – a staggering timeline by anyone’s standards. Other companies would have had the ride down much longer for such an extensive refurbishment. However, Knott’s was determined to make this happen quickly, with fantastic results. And that’s exactly what’s transpired. 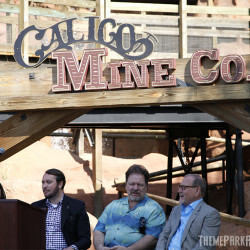 Calico Mine Co. was officially re-opened on the morning of June 12, 2014. In attendance were members of Orange County government, Knott’s management, Cedar Fair (parent company of Knott’s) CEO Matt Ouimet, Bill Butler and Garner Holt of Garner Holt Productions, Darrel Anderson (Walter and Cordelia Knott’s grandson), and invited guests including John Waite, one of Bud Hurlbut’s early employees, and Bill Reyes, an Orange County A/V designer that re-created the Mine Ride’s Cavern Room organ music. 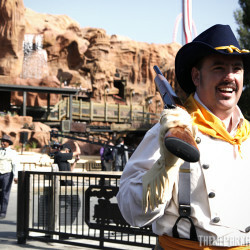 After a few spoken words during a re-opening ceremony (and some pyro blasts), the attraction was re-opened and media as well as eager Knott’s fans flooded into the queue and took their first rides on the renovated attraction. Lightning has struck twice in Buena Park. 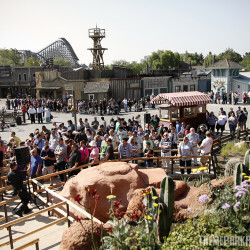 Garner Holt Productions and Knott’s Berry Farm have successfully – and faithfully – renovated both of the mountains beyond what anyone anticipated. 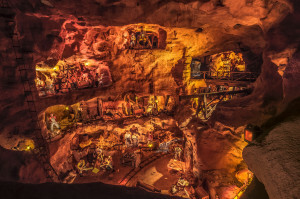 Like the Log Ride project before it, the Calico Mine Ride is now alive with over 50 new animated miners and over 50 new critters, from blind cave fish to a pair of vultures on the mountain’s exterior! Everywhere you look, there is something new to see and delightful scenes coming to life. The Glory Hole is a massive show space in the middle of the mountain, measuring 65 feet from top to bottom, and 90 feet wide. 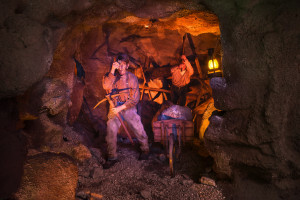 What had become a really mediocre aspect of the attraction, poorly-lit and fairly neglected maintenance-wise, is now an amazing reveal of miners at work – all moving, and beautifully illuminated! It truly is a huge “wow moment” again for Knott’s guests of all ages! 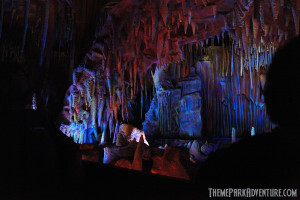 The Cavern Room was completely re-painted by scenic artist John Rayburn, who was brought on to this project due to his extensive knowledge of painting techniques, including for black light. 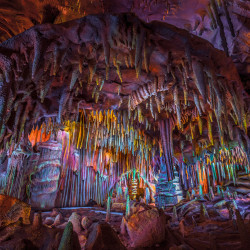 The Cavern Room definitely looks and sounds Heavenly now – and it’s eliciting “ooooohs” and “ahhhhhs” from riders – along with huge, nostalgic grins from those who’ve grown up with the attraction. 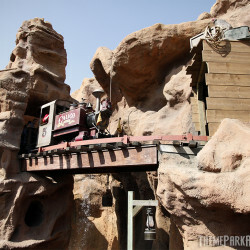 Calico Mine Ride’s finale takes visitors racing through a shaft that’s being blasted out with dynamite. It’s a climactic moment that’s never really been tremendously effective. However, using some of the original timbers and scenic props, Garner and his team have employed the use of projection, lighting and fog to make for a finale that for the first time truly is explosive! While many of the attraction’s enhancements are very visible – some of the more technical aspects of the renovation aren’t. The trains that carry passengers now feature digital recorded soundtracks – several different narrations – that are triggered by RFID cues along the track as the vehicles pass through the show building. This ensures that guests will get a clear, accurate soundtrack/spiel each time they ride. The digital nature of this technology also makes it easier for Knott’s in the future to change or add a new soundtrack – perhaps for Halloween Haunt. 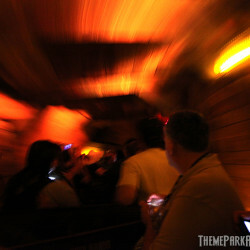 The exterior lighting of the Mine Ride is simply stunning after dark. Its waterfalls are illuminated perfectly by underwater LEDs, and its rocky facade glows beautifully. Huge kudos to Knott’s Design Specialist James Sidler and his crew – the show lighting in and around the mountain is phenomenal, and warrants a trip to Knott’s after dark just to see it! 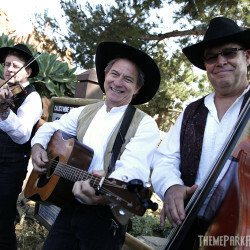 Knott’s has successfully refurbished its two most iconic attractions at the park. Not only have they done Walter Knott and Bud Hurlbut proud, they have preserved these two rides for generations to come by investing in them heavily now. The creative team at Garner Holt Productions, led by Garner himself on this project, put their hearts and souls into both Knott’s refurbishments. 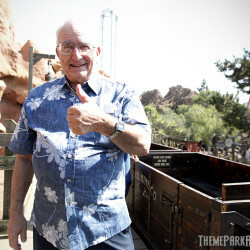 It was way beyond business for Garner; as someone who also grew up with the Mine Ride and then the Log Ride, these projects were personal, and he was very passionate about them. It shows, and everyone involved should be very satisfied and proud of themselves. 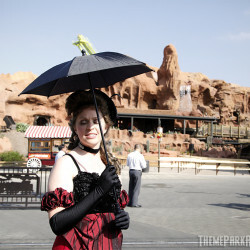 The Calico Mine Ride may not be the most famous “mountain” in Orange County these days. However, considering its scale and enormous impact on fans and designers in the industry alike, few would argue that it’s certainly the most important mountain in Orange County. And none of us could be more thrilled! TPAers, sound off! 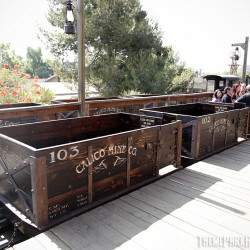 What do you think of the all-new Calico Mine Ride at Knott’s Berry Farm? Have you been on it yet, or are you planning to visit the park soon to check it out? What are some of your favorite new additions? Share your thoughts with fellow fans below! 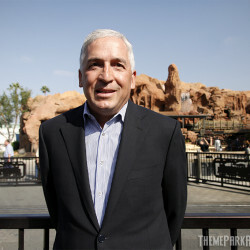 This entry was posted in Features, Home Page, Home Page Slider and tagged Bill Butler, Calico Mine Ride, Garner Holt Productions, Knott's Berry Farm, Lara Hanneman, Rick West. Bookmark the permalink.